Kichler released its new Portable LED Lantern with Bluetooth speaker. Weighing 6.5 pounds, the Portable LED Lantern is damp rated for indoor or outdoor use. The dimmable LED light omits 3000 kelvin of pure white light, runs for up to eight hours and can charge from zero to 100 percent in five hours. The Bluetooth speaker delivers 3 watts of audio output. The Portable LED Lantern can be paired with any Bluetooth-enabled device within a 30-foot range. 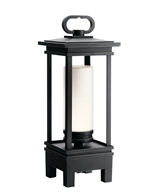 The Portable LED Lantern is available in two transitional options: The Lyndon and the South Hope. The new model has a five-hour battery life, while working at maximum volume and at 100 percent light. Additional features include removable glass, a rechargeable NiMH 3.6-volt battery and independent controls for sound and lighting.